The owners of this new residence wanted a pool for swimming laps that would have classic style in character with a “Tuscan” theme. 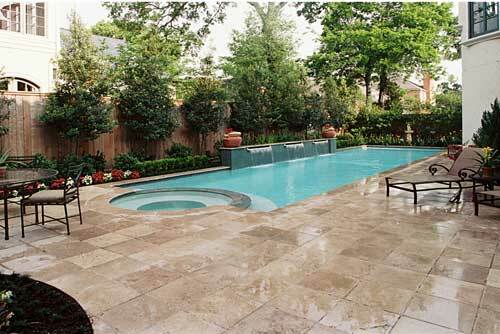 A palladium shape was originally proposed but redesigned to square off the far end for added pool area. The round spa is featured on the end closest to the loggia to accommodate up to six adults. 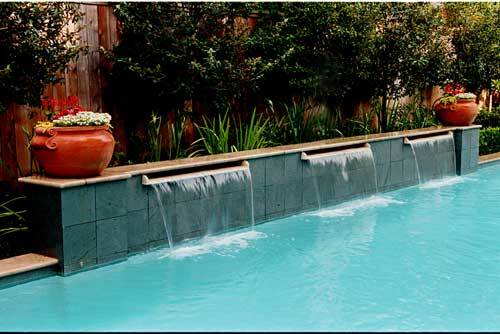 Soothing fountain effects are provided by a raised beam with three scupper waterfalls that can be seen from all patio areas with great views from inside the home. Tumbled travertine coping and deck material provides a seamless finish from the loggia to the waterline with green slate on the raised beam and waterline - matching the trim on the residence.